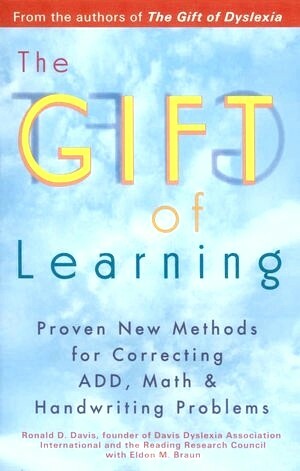 From the authors of The Gift of Dyslexia, this book provides detailed instruction in the methods developed for addressing math, attention focus, and handwriting problems. Includes a special section on motivation. Parents and teachers who have been working with students using the Davis reading techniques will find additional exercises they can use to improve other basic learning skills. 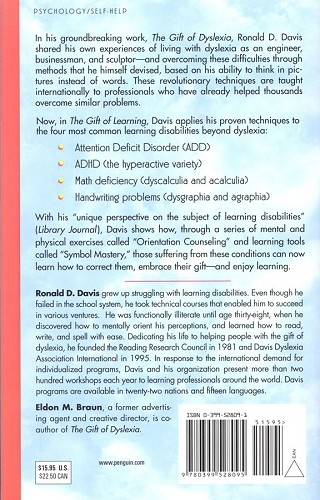 Davis Methods can produce dramatic improvements in attention span, behavior, and study skills without the use of drugs. Ron Davis discusses how disorientation affects both the “hyperactive” and “daydreamer” varieties of ADD. The Energy Dial exercise is presented as a way students can adjust their energy levels to different situations. Mastery of key concepts will give students insight into their own behavior as well as the motivation and understanding needed to gain control over their lives. Understanding the difference between numbers and numerals explains the link between reading dyslexia and math problems (dyscalculia). A student can easily see that there are four of something (a number), but doesn't automatically make the connection with the symbol 4 (a single numeral). 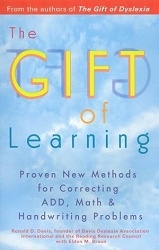 The Gift of Learning presents twenty exercises that allow a student to learn math in real world terms. There are several possible causes for illegible handwriting; most can be corrected once the student is able to achieve orientation through one of the methods presented in the book. The book describes a variety of kineshetic exercises which will enable the student to learn to write consistently and clearly. The key to success with Davis Methods is motivation. This book contains a special section explaining how to guide the student to discover their inner needs and create their own goals that will provide the stimulus for success.